Happy New Year yarn lovers! As usually happens right at the end of the year and particularly when I’m close to finishing a project, I cast on a new one. With Harrison’s Christmas hat almost finished and my Land of Sweets cowl blocking, I cast on for the Nøss fingerless mitts by Rachel Brown. These were a SUPER quick knit in bulky yarn - the luxurious and soft Tundra by The Fibre Co. We were seeing dear friends on Boxing Day and their daughter turned 15 on Christmas Eve. 15 is such a cool age and she’s a really cool girl so I thought she needed a little extra surprise separate from all the normal Christmas shenanigans (my mom was also a Christmas Eve baby so I totally get it!). Pattern awesomeness? The little cable detail up the front and back of the mittens, which was also part of the thumb and a great attention to detail. Squeaking across the finish line on Christmas Eve was a hat to match Harrison’s new winter coat. It should have been finished AGES ago but it’s grey, and while soft, was a bit ho-hum to knit. That being said, the pattern was excellent. The 1898 hat is a free pattern on Ravelry and a really interesting construction with thoughtful details. The hat band is squooshy garter stitch doubled over (with a lovely i-cord for a terrific, finished look) with built-in ear flaps to keep ears toasty warm. 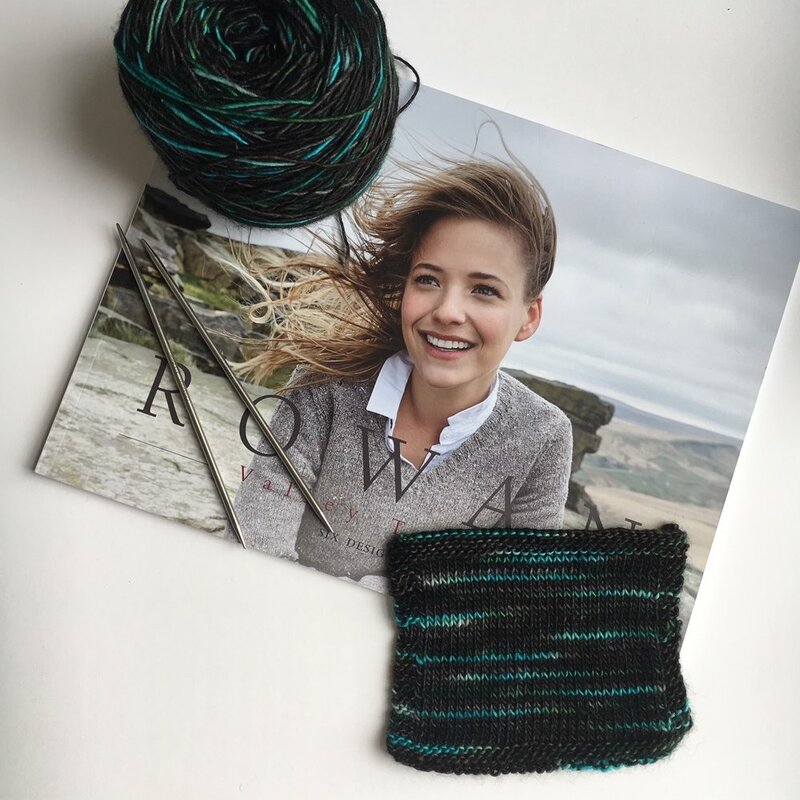 The pattern calls for a worsted-weight yarn but I used some John Arbon Knit by Numbers DK in stash that’s pretty lofty but also deliciously soft thanks to the fact that it’s organically farmed Merino wool. 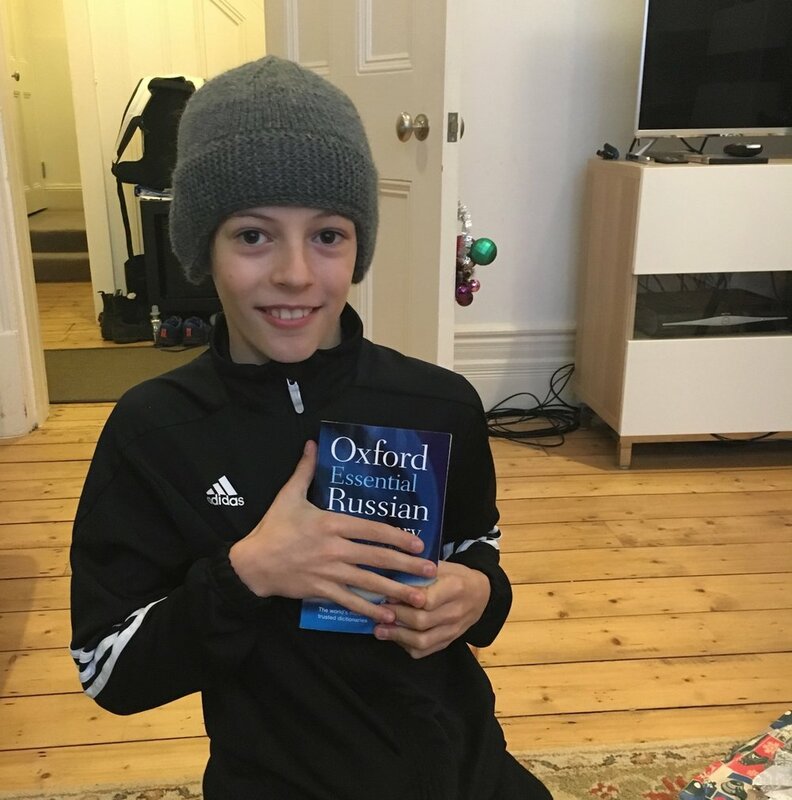 He was also very excited about his new Russian dictionary, since that’s what he chose to learn for a language this year. Definitely adventurous! Finally, my Land of Sweets cowl / advent calendar knitting by Helen Stewart gets the credit for keeping me sane and chill in the run-up to the holidays. 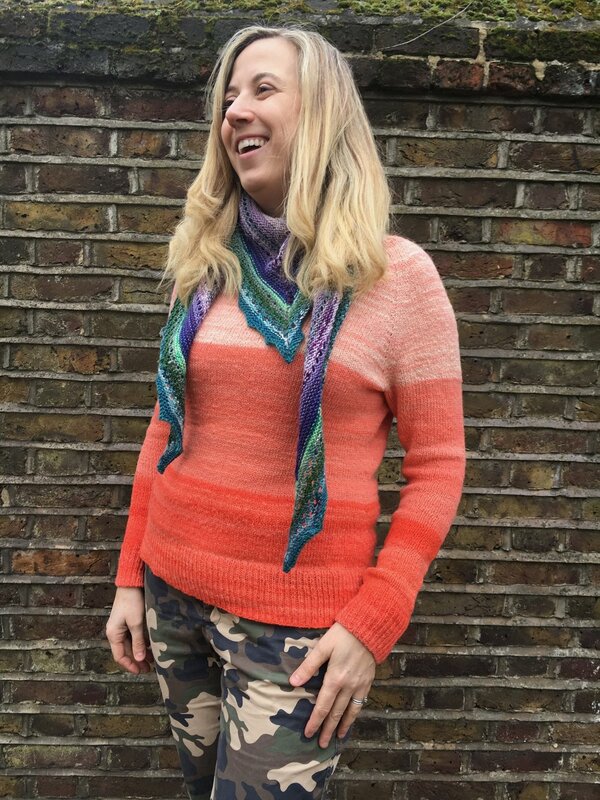 I was absolutely delighted with this knit, just eight rows per day, and it was the perfect thing to start the day with and a coffee, or work on before tucking into bed, or just in a quiet moment on the tube. 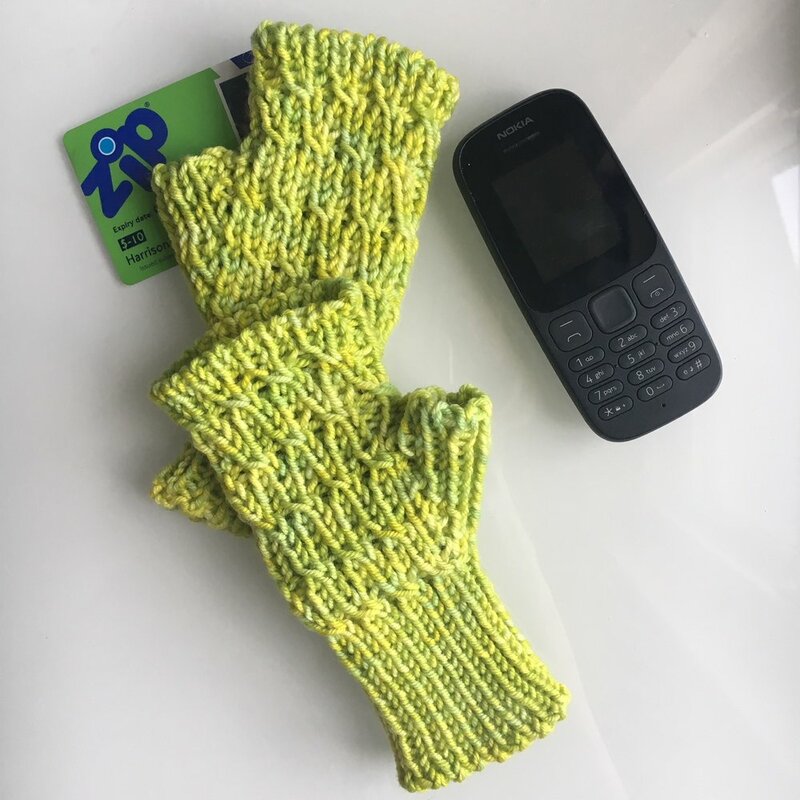 I really, really loved having just a tiny bit of knitting every day, and the surprise of seeing which colour came next (even though it was a kit that was opened all at once the year before). HUGE thanks have to go to my BKFF Rach for gifting me this present the year before, and to all the peeps on Instagram who weighed in on my colour changes and mini skein additions. I’ve decided to make my own advent calendar for 2019 with more various minis that I have in stash - but that’s a project to tackle later in the year! While the blog has been largely quiet for the better part of this year that doesn’t mean my needles haven’t been working! Following the wrap up of Yarnporium at the beginning of November I was finally able to turn my attention to finishing a few things, and starting some Christmas knitting too. The Clara dress is a darling little dress that I’ve been wanting to knit for absolute ages but all my friends kept having little boys! Some friends welcomed a baby girl into their lives earlier this year and I decided she needed something festive for the holidays. This was a great knit, if a bit tedious through the main part of the skirt but I love, love, LOVE the details in the yoke and bodice. The pattern is translated from the original Danish (it’s originally an Isager pattern and only available in kit form, unless you can find the single pattern in English from a retailer as I did). Sadly, I don’t know if the pattern has lost something in translation or if it was just that vague in Danish but a lot of details are muddled or missing in terms of sizing, needle size and yarn requirements. Yarn is John Arbon Exmoor Sock from my Mill Membership package, sadly now discontinued but due to be revived in 2019. The shoes are the Tiny Shoes by Ysolda out of Cornish Tin by Blacker Yarns, knit as a way of testing the yarn for the Yarn in the City podcast. Both lovely and crispy to knit with! Also hot off the needles at the end of November was my Countdown to Yarnporium KAL project, the Béton Brut shawl by Karie Westermann. Knit in the AMAZING Walcot Yarns (70% Falkland Merino, 30% Baby Alpaca, 100% Awesome) in Goldenrod, I couldn’t be more thrilled with the warmth and squoosh factor from the finished shawl. Karie was inspired by the National Theatre at Southbank and the strong architectural lines of the concrete building. Southbank is one of my favourite places and I’m so happy to have this shawl as a memento of Yarnporium 2018. I don’t think I remembered to make a note on my project page but the lateral lines were a bit fiddly if knitted. I used a crochet hook (same size as my knitting needles) to do the sideways/Latvia braids and found it much easier to control my tension. YMMV! Finally, after feeling a bit left out that mummy didn’t have an advent calendar to open daily with her guys, I remembered the beautiful kit that my BKFF Rachel put together for me last year to knit the Winter Dawn shawl which was the SweetGeorgia Yarns advent calendar project. Unbeknownst to Rachel, I already had the SGY advent calendar so I put the kit away with the pattern for the Land of Sweets cowl by Helen Stewart of Curious Handmade. This has been such an enjoyable knit that I’m not as amazed as I think I would normally be to find myself actually keeping up with a project! I can’t wait to wear it at Christmas and I’m excited that it will actually be FINISHED as I’ve been weaving in ends along as I go. I’d really love to wear it Christmas Eve so I’m thinking about pushing ahead to finish a day or two early so it has time to block. Is that like eating the last chocolate out of the advent calendar before the last day? ?